When Is A Hole In The Sail A Good Thing? When it causes the kite to fly straight, over a good wind range and return wonderful high flights! On its first test flight, it was clear that the 2 Skewer Diamond kite MkII had a problem in the upper end of its wind range. Shaving the stiffer horizontal spar skewer didn't make a whole lot of difference, so there had to be something wrong with the sail. As an experiment I cut a small 1 x 1.5cm hole in the pristine new sail. Halfway out to the tip and just below the horizontal spar. The hole is not visible in the photo, and certainly wasn't visible to me while observing the kite. Soon after turning up at a local oval, the light breeze gusting through seemed very ideal for flying the light-weight Diamond. Hopefully, the slightly fresher gusts would prove whether or not the 'trimming hole' was doing its thing! The kite was soon out on about 20 meters (70 feet) of line. With winder underfoot, a few photos were snapped off. Out of curiosity, I took my foot off the winder, which then proceeded to drag slowly across the grass. So, this kite has quite a low pulling force! Around 60 meters (200 feet) I stopped again and took several videos. The climb continued, effortlessly, until 90 meters (300 feet) of line was out. It seemed I had fluked the size of the hole fairly close to the proper size, since the kite was behaving very well. Hardly any hint of the previous turning tendency, with stronger gusts just sending it straight up higher. The kite appeared to wing-waggle slowly and gently while on the verge of floating face-down in lulls. At the other end of its wind range, it would wing-waggle more rapidly. However, at wind speeds in-between these extremes, it would fly smoothly with hardly any waggle at all - despite flying on a simple 2-point bridle. The simple ribbon tail stayed dead straight most of the time, with ripples travelling down its length continuously. Thin black garbage bags make great tail material! Ultra-lightweight yet highly visible against a blue or light-gray sky. Talking about visibility, the bright orange sail lit up nicely despite the sun being off to one side by quite a big angle. Orange and black works so well against a clear blue sky. A bird flying through got quite a surprise. I don't think it actually hit the flying line, but it took some extreme evasive action for just a split second when it suddenly caught sight of it very close! Most of this time the kite was anchored to a handy pole. However, I had to intervene when the kite started slowly floating down on its face for half a minute or so. Eventually, it was in danger of descending right onto a busy road which ran past the oval. After just a few quick hand-over-hand pulls on the line, the little Diamond obediently soared up a few meters and then caught just enough breeze to continue the climb on its own. Seconds later, it was up around 400 feet altitude again. 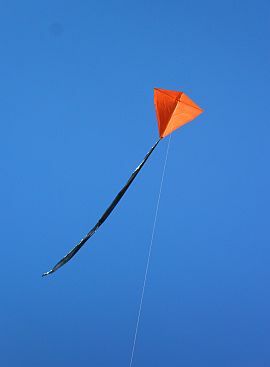 Most of the time, the 2 Skewer Diamond kite was flying at an angle of between 45 and 50 degrees, with considerable sag in the 20 pound Dacron line. However, for a few delicious moments, a large thermal pushed the kite right up to 80 degrees where it spun around in a few tight circles before starting to descend once again. I never saw the original 2-Skewer Diamond do that! While the kite was in the air, at least 3 passenger jets flew over. One jet was overflying the city at high altitude, while 2 others, just minutes apart, were climbing out from Adelaide airport. Which, by the way, is a safe distance to the north of our local area. No chance of snagging any kite strings - although the 2 Skewer Diamond kite was a bit wayward today in nearly reaching 450 feet above ground... 400 is the legal limit. The 2-Skewer Diamond kite returned a very pleasing flight! If you haven't made any 2-Skewer designs yet, the Diamond would be a great place to start.